They were better than a perfect 10 to start the season. It was a baker's dozen to be exact at 13-0-0 when the Air Force Academy took out Colorado College in the biggest home game in the program's history the day after Thanksgiving. Call it having their wings clipped or a few feathers plucked. The Falcons have encountered a bit of turbulence since, going 2-4-1 . Senior captain Mike Phillipich has one theory; sixth-year coach Frank Serratore has his. "A couple of us older guys got together," said Phillipich, "and talked about the different feel in practice lately. Our defensemen felt we were the toughest forwards they played against throughout the season in practice. As the season wore on, they felt it was getting easier and easier to play against the forwards. We need to get that work ethic back in practice. I think we started to take too many things for granted." "We need to become the hunters again," Serratore said. "We've become the hunted a little bit. We had a nice run there in the beginning and we probably came back down to earth a little bit. It means something to beat us right now. No question (we're wearing the bull's-eye). "Quinnipiac came out (two weeks ago) with a great sense of urgency, and when they sensed that they had more than a chance, they took it to us with great intensity. All while we lost some of our urgency and aggressiveness." Get into a chat with college hockey pundits about Air Force's aggressiveness, and it doesn't take long to get to the last games in '07 and '08 when the Falcons went on a seek-and-destroy mission in NCAA play. "We have a huge motivational bump off the last two NCAA games actually," said Phillipich about the crushing first-round losses to Minnesota, 4-3, in '07, and Miami in OT, 3-2, last year. "Our end goal is to try and get there each year. That sits both in the front and back of our minds. The overall work ethic the past two years has showed us the fruits of our labor." That labor produced an increase from 19 wins in '07 to 21 last year. The current squad is on pace to break the program's all-time record of 25 wins in 1971-72. "Those last two NCAA games have given us the confidence to go up against any team on any given night," Serratore said. "But, it's a fine line between winning and losing. 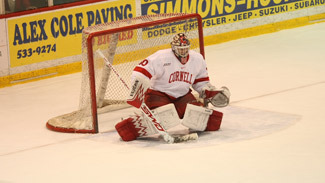 In college hockey, the group between No. 10 through 55, there's not a heck of a lot of difference between those teams. Somebody with a more gusto on any given night can make all the difference." At 15-4-1 to begin the second half, including a six-point lead over RIT in the Atlantic Hockey standings, look for Air Force to re-establish its gusto for one major reason - and cast of others to support it. "Our skill level has gone up over each of the past two seasons," said Phillipich. "Our goaltending has been the most consistent," said Serratore about his iron-man goalie Andrew Volkening, who has played all 20 games with a 1.63 GAA and a .932 save percentage. "Our goaltending had not allowed more than three goals in any game (until Dec. 30)." Then comes the nation's highest scoring defenseman in senior Greg Flynn. "On a national level, he's with the best," said Phillipich about Flynn's play, and his 24 points. "As solid a D a you'll find." While Serratore is still searching for scoring consistency, there's no disputing the fact that his high-octane offense also ranks among the best in the country. "We have (Jacques) Lamorreux and (Brent) Olson and (Josh) Frider as the second line," said Serratore, "and (Jeff) Hajner and (Matt) Fairchild and (Derrick) Burnett. But it is all basically 1A and 1B those two lines." Lamorreux, Olson and Flynn have 30, 26 and 24 points respectively, while Frider's 22, Fairchild's 17 and Hajner's 16 provide the Falcons with deep scoring capacity. Scott Mathis, Michael Mayra, Brad Sellers and Tim Kirby round out the blue line. Serratore's knows his teams are among the best in the checking department -- as in checking their egos at the door. "Looking back," said Phillipich about the end of this season, "both on a personal level and team level, we gave it all we had. The senior class left its mark on the program and the institution as a sports team before we (move on to serve our country)." On Campus clips -- Holiday tournament results last weekend include Minnesota beating Northeastern, 3-2, in the Dodge Holiday Classic championship; Vermont besting St. Lawrence, 3-2, in the Catamount Cup final; Ohio State topping Clarkson, 2-0, in the Ohio Hockey Classic final; BU copping the Denver Cup with a 4-1 drubbing of Denver in that final. ... The Alaska Nanooks' 10 wins in 20 games already surpass their total from last season of nine wins in 35 contests. Alaska has also matched last season's conference mark of eight wins in the first 16 games. ... Back-to-back losses to Clarkson and Army at the Ohio Hockey Classic marked the first time the Miami RedHawks have dropped two straight non-conference games since 2004. ... Michigan sophomore Louie Caporusso leads the nation with 18 goals in 20 games. ... Quinnipiac's Bryan Leitch leads the nation in scoring with 31 points. ... Michigan State senior goalie Jeff Lerg is now one victory shy of tying Ryan Miller for fourth place on the all-time wins list. Miller recorded 73 victories at Michigan State. ... Notre Dame's two wins at the Shillelagh Tournament give the Irish a school record 16-game unbeaten streak, as they are now 14-0-2 since Oct. 31. That breaks the previous streak of 15 (15-0-0) games without a loss that was set a few years back -- between Nov. 4, 1983 and Jan. 21, 1984.